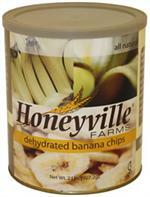 Each # 10 Can of Dehydrated Banana Chips contains 2 pounds of product. 2 pounds of Banana Chips measures out to about 40 1/4 cup servings of dried bananas. Each #10 Can contains 8 ounces of Freeze Dried Apples. 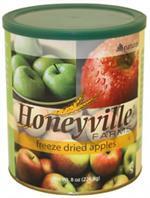 Honeyville's Freeze Dried Diced Apples are produced in a process where moisture is removed from the frozen product using a very low temperature and a vacuum. 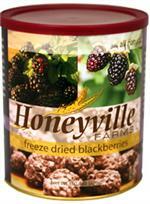 Each can contains 37 1/4 cup servings of Freeze Dried Whole Blackberries. Each #10 Can contains 12 ounces of Freeze Dried Blueberries. 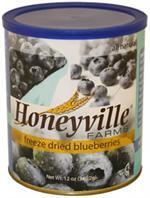 Honeyville's Freeze Dried Blueberries are produced in a process where moisture is removed from the frozen product using a very low temperature and a vacuum. 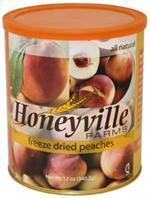 Freeze Dried Peaches can replace Fresh Prepared Peaches at a rate of 9 to 1. 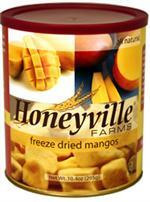 That means each can of Honeyville's Freeze Dried Peach is the equivalent of nearly 7 pounds of Fresh Peach. 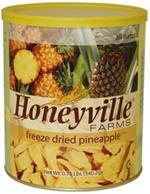 Each can contains 12 ounces of Freeze Dried Pineapples. 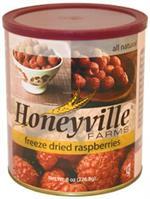 Each can contains about 40 1/4 cup servings of Freeze Dried Raspberry. Each #10 Can contains 6 ounces of Freeze Dried Strawberries. 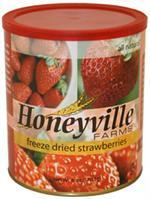 Honeyville's Freeze Dried Strawberry Slices are produced in a process where moisture is removed from the frozen product using a very low temperature and a vacuum.